Staying in a guesthouse for a limited period ought to dampen my culinary adventures somewhat. I have hardly any access to the pantry elements I usually have access to.I don’t want to stock up on ingredients which I will have to leave behind when I get back home. And the kitchen itself though large has hardly any of the equipments which I take for granted. Mixer? No! Tin-opener?? No :<. So I surprised even myself when I found myself making something which could actually be put on a blog. I had more or less made up my mind that it would be relegated for the next 6 months. This is a lentil soup. Simple, hearty and requiring no introduction as to its nutritive value. 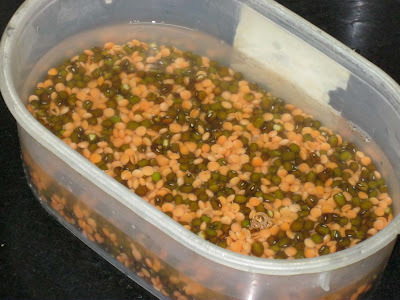 Wash the peas/lentils in cold water a few times until the water does not change colour. Soak the peas/lentils in plenty of water overnight. Bring 3 cups of water to a boil in a kettle. In a large heavy vessel with a tight lid heat the oil. Saute onions until lightly coloured and transparent. Add hot water to the vessel. Wash the lentils once more before draining the water and tipping it along with the onions and boiling water. Close lid and cook at the lowest flame for 1 hour (or until done). In the meantime, grate ( I used a peeler here) the rind off an organic lemon, about half teaspoon. When the lentils are softened, add salt to taste. Start with half teaspoon. Let the salt be incorporated before adding more. Take off the flame, add the lemon rind, cover and cook for 5 more minutes. I ate it hot with a bowlful of plain rice.